One of the greatest fears people have for their cell phones as they have become such a vital part of our lives is the idea of them getting damaged. One of the worst possible scenarios is when it gets wet, but luckily all is not lost when that does happen, but you do need to act quickly. If you find yourself in the undesirable situation of your cell phone getting wet in some way, not all hope is lost, bu you must act quickly if you are to avoid any more damage. Having gone through this myself recently, I speak from a place of experience. First, and most importantly, you need to pull the battery out, and leave it out until the other steps are finished. If your phone has a non-removable batter (i.e. an iPhone) then you need to power it completely off if possible. The next step leaves you with two options to dry out the phone, with one of them be much more likely than the other. One possible way to dry out the phone is to bury it in a bowl of silica gel packs, those little packets you find packaged with every electronic device you purchase. Considering the number it would take to totally submerge a phone in them, the likelyhood is that you won’t have enough on hand to use this method. 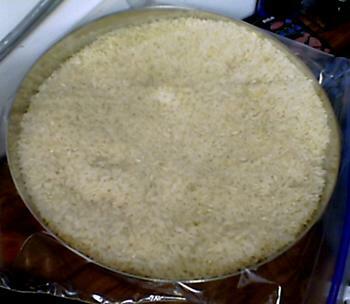 The second is to bury the phone completely in a bowl of rice. The picture you see to the right is the bowl I put my phone in, and as you can see, not one part of my phone was visible. As for how long you need to leave it in there varies depending on who you talk to, but the best rule of thumb is 24 hours to completely draw all of the moisture out of the handset. Once you feel all of the moisture is out, then you can put the battery back in to see if it powers up, but if you see he slightest trace of moisture, pull the battery out again and put the phone back in the rice for a while. None of this is fool proof, and your phone may still be fried, but this should at least give you a fighting chance. Some people suggest you use a hair dryer, but that isn’t going to help the situation, and you could run the risk of damaging the more sensitive circuits. There are apparently some heating measures that work as the Yodobashi Camera store chain in Japan has been installing the dryer box you see to the right, which they charge you $12 to use only if the phone successfully powers on after you use it. I have no clue how these work, but apparently they have at least some success with them. Of course the best policy is just to be careful with your phone, but if this should ever happen to you, just remain calm and use the method that works best for you. What say you? 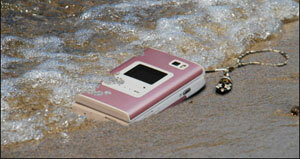 What ways do you know of to save a cell phone that gets wet?